The Chief Executive of Hong Kong, Donald Tsang, has said his administration is working towards democratic elections. 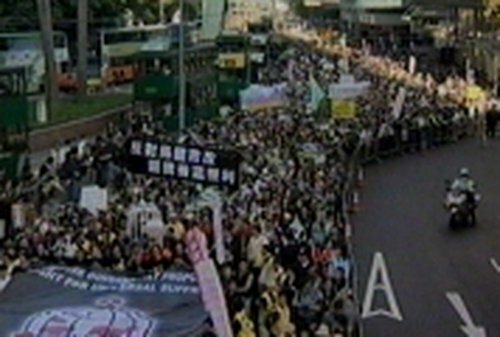 He was speaking after an estimated 250,000 people took to the streets of Hong Kong calling for universal suffrage. But Mr Tsang defiantly refused to give in to calls for swifter change, saying the Chinese territory must take it one step at a time. Hong Kong's chief executive is approved by China's leaders and picked by a Beijing-backed committee of 800 electors. Only half the members of its 60-seat legislature are directly elected. The Tsang administration's reform plan would double the size of the Chief Executive selection committee and add 10 seats to the Legislative Council, five of which would be directly elected. Opponents claim Tsang's proposals would amount to a step backward for the full democracy spelled out under the Hong Kong constitution. Democrats in the legislature say they will veto the bill unless the Chief Executive offers a timetable for democratic reform. Rows over the timing of democratic reforms have dogged Hong Kong politics since China regained control of the city in 1997. It is thought today's massive turnout could weaken Tsang's political base and rattle Communist Party leaders in China, who fear reform might weaken the city's economy and spark calls for change on the mainland.